Beautiful nursery art doesn’t need to cost a fortune. With a touch of creativity—and a few helpful tips—you can make your own gorgeous, DIY nursery décor for a fraction of the cost. Feeling crafty? Why not give one of these simple, DIY gems a try? Looking for a cheap alternative to expensive, store-bought nursery prints? Stop scouring the web, and head over to your favorite local bookstore. 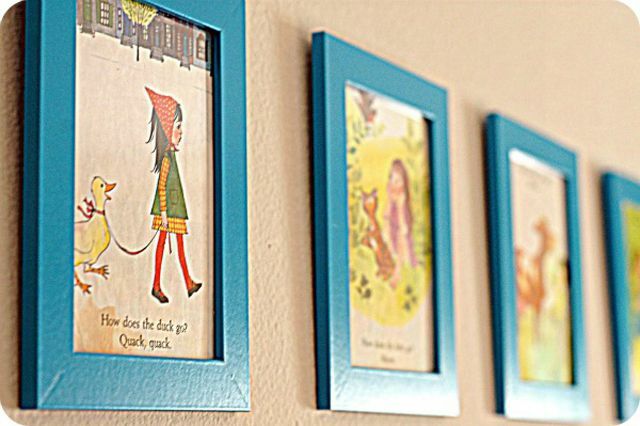 With the aid of some inexpensive frames, the children’s books you adored as a kid can be easily transformed into meaningful wall art for your little one. Choose a few beautifully illustrated, well-loved classics, or settle on a single title and use it as the basis of a theme. Photo Courtesy of The Farmer's Nest. Working with an alphabet theme? Consider picking up a pack of attractive flash cards. These classic learning tools can be as beautiful as they are educational. Frame them individually, or create a colorful collage. Love all things vintage and Shabby Chic? Try using miniature clips to string vintage cards on a wire. Photo Courtesy of Jane D Photography. Elegant and affordable, vintage sheet music can make for beautiful nursery art. Choose your little one’s favorite lullaby or any other song with personal meaning to your family. Frame the title page or display the entire song. Want to add a pop of color? Try mounting your sheet music on colorful card stock. This simple yet sophisticated alphabet display was created using leftover fabric scraps and inexpensive cardstock. Cutting and pasting not your thing? That’s what friends are for! Set up a crafting station with supplies that compliment your nursery colors and theme, and invite each guest at your baby shower to create a letter for your little one. Ask your friends to bring a cheap, second-hand picture frame for their creation. A quick coat of spray paint and you’ll have an elegant and eclectic set! Photo via Catch My Party. Your baby’s name is like music to your ears, so why not make it a treat for your eyes too? These adorable, yarn-wrapped letters are as simple as they are beautiful. Cut each letter out of cardboard or foam core. Using craft glue and tightly spun yarn, wrap your letters a few inches at a time, applying glue to the back as you go. Finish with a few pretty embellishments for the perfect touch. Photo Courtesy of Lilly's Notebook. Your newborn may not be much of an art connoisseur, but in their eyes, few things are as beautiful as the people they love the most: Mom and Dad. To create your own artistic renderings of your baby’s favorite subject, try creating a silhouette using this simple tutorial. Just cut, paste and frame! Photo Courtesy of Nana Company via Flickr. Not a fan of traditional silhouette portraits? No one ever said your subject had to be human! You can make a silhouette out of almost anything - your favorite animal, a tree, a car - whatever takes your fancy or suits your nursery’s theme. Once you’ve settled on an image, use it to create a template. Place your template on the back of some cute fabric or card stock and trace its outline. Then cut and mount your image onto a contrasting background using craft glue. Add a nice frame, and boom! Gorgeous wall art! Photo Courtesy of Kitty Lascurain. Not much of an artist? If you can use a paper punch tool, your own paper-punch masterpiece is just a few clicks away. All you need is some self-adhesive foam squares, a selection of colorful paper, and a box frame. You can even use paint sample chips or paper salvaged from magazines! Get step-by-step directions right here, or try making a similar project using felt. Photo courtesy of Erica Brower Photography. Choose a selection of colorful fabric scraps slightly wider than the hoops you plan to frame them in. Place the fabric in the embroidery hoop, pulling it taut. Place a small amount of glue around the inside edge of the hoop, pressing down the fabric as you go. Trim any excess. Easy! Large, empty frames add drama to these beautiful, vintage baby clothes, transforming them into works of art. For extra punch, try adding a colorful cardboard backing.